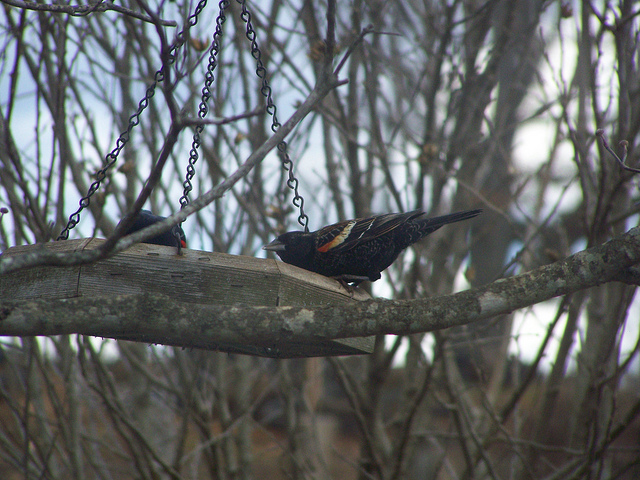 Friday these beautiful red winged blackbirds stopped by our feeders for a little snack. �They are usually the first birds to return in the spring. �They are a week earlier this year than last year. �Hopefully, that means an early spring. � However, this morning was no indication that spring is on its way. �Wind chill temperature -10 degrees with snow on the ground. �Well, the snow is gone now and the wind chill now is 5 degrees so we are warming up some. Not much going on here. �I have started work on Sam’s quilt. �I have all the 5 x 5 in. squares cut out and am ready to start sewing them together. �School has went well this week. � Did I mention to you all about the last batch of homemade laundry soap I made using the laundry bar soap instead of fels naptha? �Well, those of you who have been reading my blog for a while know that in the past I have had trouble with the homemade laundry soap. �My clothes seem to get a dingy look and the towels became really non-absorbent. �I know, strange stuff, but strange happens a lot here. �I guess it is our water that causes these problems. �Well, so far I have had no problems using this batch. �It is a little bit different recipe than I have tried before but I think the real difference is using homemade laundry bar soap. �I will try to remember to keep you all updating as to how it is doing. Well, I better get busy. �Church tonight and the menu is baked potato bar. �Sounds delicious to me. �I really like baked potatoes. �Enjoy your Sunday and God bless. These are two pound recipes.